Chaga is known to be a very powerful superfood, containing huge amounts of healthy ingredients and antioxidants that keep you healthy and prevent disease. Let’s make everything around the Chaga tincture clear. We’ve seen many online products and formulations for Chaga mushroom tinctures, but guess what? Many of them are pointless and unnecessary! Why? Because you can make the same (or better) Chaga tinctures yourself, and much faster and easier. If you’re ready, let’s start. What Is A Chaga Tincture? A tincture is an extract made by soaking something in alcohol. A tincture is a supplement that is a very healthy drink that is full of antioxidants. Antioxidants keep us healthy because they make free radicals less harmful and this keeps diseases away. A tincture is just one way to store and consume Chaga. There are other ways like Chaga tea, coffee, pills, powders and so on. Tinctures, however, tend to be the most concentrated way to consume it, and the most efficient way to store it. Chaga is proven to be very efficient against cancer, psoriasis and other diseases. Also, since it keeps our immune system operating better, it’s good for seasonal diseases too like flu, cold and other viruses. It has both preventative and direct effects. Personally, we’ve used it in cases where we feel a cold coming on. Taking Chaga at this time can reduce the severity and the length of the symptoms. How To Make The Tincture? There are several ways how to make Chaga tincture. We’re going to show you the main ones, which are easy for everyone to do. We’ve figured out a new Chaga tincture method that is probably more efficient than the ones described on the internet. Ordinary tincture takes months before it’s ready to use. However, it doesn’t have to be that way and on the other hand it’s more efficient, we find. To get all the healthy nutrients out of chunks, it needs to be heated. Heating cracks the chitin cell walls and ingredients can be released. What is needed to make Chaga101’s Tincture? Start by heating Chaga chunks, similar to the pot method of making tea. Take 1 part water to 1 part alcohol. If you have 0.5L of alcohol, then you should take 0,5L of water. Place Chaga chunks to bottom of the pot. Add the water to the chunks in the pot (not the alcohol!). When the water starts to boil, turn the heat to low and simmer for at least 30-45 minutes, uncovered until the water has been reduced by half, or until there is little water left. After reducing the Chaga mixture, remove from heat and let it cool. Once cool, pour it into a jar. Add the alcohol to the jar. If you want, include all the chunks in the jar too. Shake it firmly and store it in a dark place for 1 week. After 1 week, filter the mixture, and pour into the bottle. Add water to taste, or leave it concentrated. NB! Be careful; you need to watch this pot, so it does not boil dry. What you are doing is concentrating the Chaga ingredients, while removing the water. Don’t let the pot boil dry! Normally a tincture takes at least a month to make (see below). However, in this case, the heating has cracked the cell walls of the Chaga wide open, and the ingredients have now been released and concentrated in the water. Adding the alcohol will get the last bits of healthy ingredients from the Chaga chunks. You could take a tablespoon out right after step 4, and consume it. After a week, it will be totally ready. Consume one tablespoon (or 1 dram) at least once a month. Advantages of this chaga101’s tincture recipe is that it takes much less time and it’s ready to consume after several hours. The effects should not be weaker. Chaga101’s TIP: If you want, you can put smaller Chaga chunks into the bottle. It adds stronger flavor and also it looks more stylish. If you use the Chaga101’s tincture as a gift, it looks much nicer than just a nice bottle with brown liquid. Another TIP: You may notice that the preparation here is similar to the pot method of making tea. Be creative with your Chaga chunks! When you make tea by the pot method you could remove the chunks and place them in vodka to make a tincture. So you get 2 products in one. Of course, this method would give you a less concentrated tincture because you already drank some of the ingredients with the tea. But some do remain in the chunks. Don’t waste them. It was just Chaga101’s recipe. There is more tincture recipe, what you can use. Depending on your needs. This is the most popular one! #1 – Place the Chaga chunks or powder into a glass jar. It is important that the glass jar has a lid that can be sealed, as you don’t want the alcohol to evaporate. It’s easy to use chunks instead of powder for these processes. The Chaga amount should be around 1:10. Vodka is used the most cases. It is often misunderstood that the stronger the alcohol the better. Absolute alcohol kills bacteria pretty well but it doesn’t make any sense for Chaga tincture. 40% alcohol works just as well as higher concentration! Check that the lid is tight enough not to let the alcohol evaporate. I suggest to mark the date and month to the jar because believe me, you won’t remember later, when it was stored 🙂 You may as well mark a line on the jar at the top level of the liquid, just to be sure your lid is sealed: the liquid in a sealed jar should not go down. Shaking helps chunks to move and break apart, giving new spots where the alcohol can soak in better. 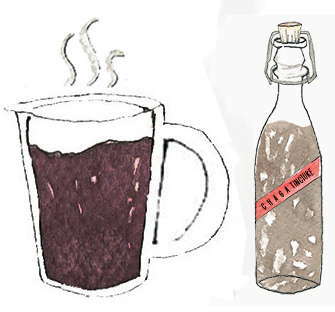 There are Chaga tincture recipes that tell you to shake it every day. Why? Actually, there’s no such need to do it that often. Just shake it occasionally. Consumption is quite easy. This Chaga supplement is quite strong. What should be the Chaga tincture dosage and how to consume it? You could just pour the alcohol into a sealed bottle, and use this as is. It is still 40% alcohol. You could take one tablespoon of this, at least once a week. But since you are making a double tincture, not pure tincture, then you have some steps ahead. Do you see those Chaga chunks in the jar full of alcohol? Well, they still have healthy nutrients left in them too. It did not all go into alcohol. We know that by heating Chaga, the chitinous cell walls crack and release all those ingredients. Therefore, it is suggested to make another extraction with hot water from the same chunks that have been soaking in the alcohol. Also, this makes the tincture smoother, because it will dilute the alcohol by 2/3rds. After two months in alcohol, it’s ready for double extraction. We’ll show you the Chaga tincture recipe for double extraction too. There are very complicated Chaga mushroom tincture recipes online. We have an easier one that’s just as efficient. For double extraction, pour the alcohol into a glass bottle. Now you want to get most out those chunks that are still in the jar. Remember, by double extract you’ll extract more healthy nutrients out of Chaga cells. Also, the chunks are full of alcohol that you want to collect. After you pour the pure tincture into a glass bottle, take your remaining Chaga chunks and put them into a wide-bottomed pot. Now let’s get every bit of nutrients from them. There are some recipes online that make this process extra complicated. Don’t worry, these methods don’t add value, but just make things more complicated – the results are exactly the same. Measure out the water – If you had 10oz of tincture saved in your bottle for example, then measure out 10oz of water. Put the water on the used Chaga chunks, and heat. When the water starts to boil, turn down the heat and let it simmer for at least 30 minutes. Keep the cover on, because you don’t want the good ingredients to! You’ll see that the water turns brown, with bubbles coming from inside the fungus. After your Chaga chunks have simmered in water for at least 30 minutes, then it’s time to let it soak. Turn off the heat and let it sit for at least 15 minutes. The strong chitin cells have cracked in the heat, so this method is getting the most out of the Chaga. Also you want it to cool down for the next step. Well, now, take the liquid extract from the boiled water pour it to pure tincture which you have on the bottle. Keep the Chaga chunks in the pot! Typically you should get 70-80% of the water you poured to double extraction. It might be a good idea to filter this through a coffee filter first, so you don’t get any chunks into the liquid. But that’s up to you. Do it one more time – You’re halfway there! Measure the same amount of water as you used the first time. If you don’t know, how much it was, just follow your sense – it doesn’t play a huge role if few oz here or there. #11 – ENJOY Your Chaga tincture! Well, you made it! Now you should have Chaga tincture which has almost 1/3 of pure tincture and 2/3 of soaked tincture, which has strong chitin cells cracked. Now add them all together, including the liquid from this second water extraction to the jar containing the alcohol, and the first water extraction. You should end up with 25-30 oz of tincture, containing concentrated Chaga, and 13% alcohol. Now let it cool down, shake it and you’re ready to consume it. If you have Chaga supplement without double extraction, then it’s not as strong, but it is high in alcohol. It would be good to consume a tablespoon of it (or one dram) at least once a month – better to take it once a week. Also, if you feel you’re getting sick, it would be a good idea to take it as needed, because there are lots of antioxidants that fight free radicals and could keep you healthy, or at least reduce the severity of an oncoming cold. TIP! If you feel you got cold and tomorrow you might be sick, drink one dram of Chaga tincture. It might help prevent flu and other seasonal diseases. Chaga tincture benefits are the same as other preparations. It’s just a good way to make, store and consume it. So, to keep it simple – it’s full of antioxidants to keep you healthier and keep diseases away. It may even prevent cancer. Also, one of the great benefits is the ability to keep you healthy. If you find yourself chilled from cold rain, or you get your feet wet and are worried about getting a cold, take some tincture. We’ve personally experienced that sinking feeling; “God-I-will-be-sick-tomorrow”. So, whenever you feel this way – drink some tincture. Also, by making Chaga tincture, yourself, you control the quality. If you buy it online, there could be quality issues. So, take your time and let’s get in the habit of doing it. You can read more about the buying guide here. People are often curious about this comparison. They are both healthy and quite different. Which one is better? They both are! The golden rule is that you can consume Chaga tea every day, but Chaga tincture should be used once a week or less. If we talk about the health benefits, then they are both fine as we wrote before. Chaga cells have very strong chitin cells and therefore to release healthy nutrients, it must be heated. If you make Chaga tea from powder (the quickest method), or if you simmer Chaga chunks for 30 minutes for your tea, then the tea will contain the same things that the tincture does (from the double extraction). So, both are very healthy and can be consumed simultaneously. Chaga tincture is an extra healthy way to consume this mushroom. Making it isn’t difficult but you need time and patience. Consuming it is a good habit for you and for your (adult) family. Combine the two extracts into a tincture and enjoy! We have found that Chaga tincture is a great gift idea! Typically when people hear about all the benefits of Chaga, they soon reply; “cool, I want to try it”. Therefore we’ve given bottles of pure health to our friends as gifts. They love it! The main thing you should remember is that it takes 2-3 months to prepare a tincture (unless you use Chaga101’s recipe). You just can’t have an idea on Christmas eve, and think your gift will be ready the next day. It takes time. You need to find some nice bottles, and then take the time to prepare it. This is part of thoughtful gift giving. We have found that the tincture is a great gift idea! NOTE: It is a good idea to keep some ready-to-use tincture bottles in your home. Then you have a last minute gift idea which on the other hand is 100% natural and made by you. This gift’s value is much higher compared with some else gift from the shop. Adding value to this thoughtful gift would be to add a description of the benefits of Chaga, and how to use it. Recommend that they drink it once a week, or let them find out for themselves how often they would like to use it. Chaga tincture is a very powerful superdrink, and consuming it is a good habit. Once a month can give you the results that you would not regret. It may keep you from a very bad state. Chaga’s effect against cancer has been proven and we should not ignore this fact, but rather, use it to our benefit. Tincture’s importance comes into play during cold and flu season. Right when you have that feeling that “Oh man, tomorrow I’ll be sick!” you should drink a Chaga tincture. The huge amount of beneficial ingredients may boost your immune system just in time. All this combined makes Chaga tincture a really good mix of health and wellness! A Chaga tincture is a powerful drink containing alcohol, that is full of antioxidants. It keeps you healthy. It is made of Chaga mushroom, which grows on birch trees. How is Chaga tincture made? 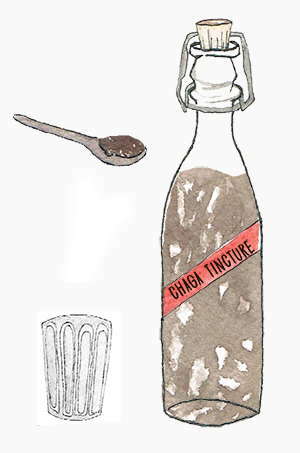 The Chaga tincture is made by soaking Chaga chunks or powder with vodka, or any strong spirit. It takes at least 2 months to make it. Why do I need the double extraction, rather than just the alcohol extract? Chaga cells are very hard and to get the healthy nutrients out, you need to break the cell walls. You could just do the ordinary tincture, but you would lose some of the healthy extra ingredients that you would get from double extraction. What is Chaga tincture good for? The tincture (like Chaga itself) is known to be very powerful against different diseases like cancer, psoriasis and others. You can read more on Chaga and medicine page. How long does Chaga tincture stay preserved? 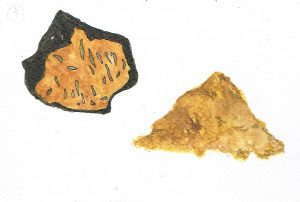 The main component next to Chaga is alcohol. Alcohol is a known way to keep healthy ingredients preserved. If stored in a dark place, then it can keep for over 10 years without losing its healthy ingredients. Can I use other alcohol? Of course. But be very careful; only drinkable alcohols. NOT methanol, or antifreeze! There are plenty of alternatives to vodka, like rum, gin, or whiskey. Keep in mind that the alcohol doesn’t contain the health benefits (and in fact is bad for alcoholics) – it’s the Chaga that provides the health benefits. The alcohol just preserves it. Can I use Chaga tincture on kids? No, that’s not recommended because alcohol should kept away from children. The double extracted tincture is as strong as wine. However, pure Chaga hasn’t been shown to be harmful for children. Chaga Health – what is it? Chaga health is a phrase we hear sometimes, and we’ve thought about it a lot. The short answer – We don’t know exactly what it means. Maybe its a catchy marketing phrase to describe all the healthy benefits of Chaga. Where are Chaga tinctures for sale? Well, there are plenty of places where you can buy it online. However, we’ve always recommended that by harvesting it yourself, and making it yourself, you can control the quality of the product at every step. If you can’t do it yourself, then you should only reputable sellers that you can trust about the quality. So, if you’re looking online where to buy Chaga tincture, at least make sure it’s wildly harvested and well prepared. This chaga buying guide will help you. Once you have used the double extraction method for the ground chaga and your tincture is made, is there anything else you can do with the ground chaga (used for the tincture)? Coffee or tea for example. By the time you’ve done the 2nd extraction you have made Chaga Wine at 13% alcohol. This requires some thought as to what a few perfect base 40% alcohols might be. Hmm – single malt Chaga Wine or perhaps Allambic Brandy Chaga . BTW – I make Chaga Iced Tea (the chaga chunks steeping at 170° F for 8 hours with a sous vide) and add just a bit of maple syrup for sweetener. Oh my , that is soooo good. I found I can do this twice with the same batch of Chaga and still get delicious flavor, though I can’t say that the health benefits are equal with the diluted batch. I have just started processing chaga I have found in my woods. I have a small hand grinder and several food graders. I purchased tee bags at a health food store and fill my own. My next step is to make some tincture. Have been reading different articles on the process. I drink 2 cups of chaga tee daily.